Thriving since 2012 and award-winning for the past three years in a row, Between the Lines offers one-on-one tutoring services to students who seek help with writing instruction as well as a wide variety of reading support and enrichment. 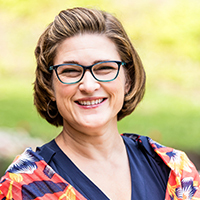 Carrie Waldron-Brown has an exemplary academic background and experience both as a teacher of English and Language Arts (certified in PA 7th-12th grades), as well as expertise running and establishing Writing Centers. Carrie Waldron-Brown works with students wherever they are in the writing process to provide them with strategies to demystify and enrich their understanding of how to write with clarity and confidence. Also addressed are grammar/style/mechanics tools to support convincing and well-organized writing. Having taught students from age nine through college, Carrie Waldron-Brown is well versed with much of the literature cannon and supports students to better analyze texts wherever they may be on their learning journey. Carrie Waldron-Brown assists students with learning techniques to better grasp and plan out their work for many elements, from writing their first paragraphs and essays to research papers, from exam strategies to SAT/ACT test preparation. When students desire to accelerate their learning, Carrie Waldron-Brown works to develop Independent Study Projects with curricular components to complement their class instruction. Carrie Waldron-Brown also instructs students from afar—from Georgetown to Miami, from New Orleans to Boston—from assisting the development of a research paper to editing their writing. Additionally, Carrie Waldron-Brown can help with the analysis of a text: she uses FaceTime and Google Docs with her students to ensure a successful, collaborative approach. There are specific components (especially essays and grammar) for standardized tests which Carrie Waldron-Brown instructs and supports. “I went to Mrs. W-B in 11th needing help with my writing skills. She made it very easy for me to become a better writer. Her writing methods and strategies make me capable of comprehending how to confidently structure an essay and develop my analytical expression. Altogether she has helped me grow as a writer while also strengthening other elements of my junior and senior high school English curriculum. Carrie Waldron-Brown, M.A., has a Masters in English Literature from Middlebury College via Oxford University, and a Bachelor of Art in English from Barnard College/Columbia University; she also has a PA English teaching certification (7th-12th grades). As a career English teacher, her wheelhouse is in writing instruction and literary analyses as she guides students with everything from 5th graders needing writing fundamentals to college students delving into research papers. Mrs. Waldron-Brown has expertise supporting students at any stage of the writing process with every kind of writing assignment, including expository and persuasive papers, the college essay, and the ACT essay. Furthermore, she can skillfully tutor not only English curricula but also other coursework as well as address students’ overall organizational needs. Mrs. Waldron-Brown has a lifelong dedication to education. Recently, she helped launch The Grayson School where she was a Founder, Writing Center Director, and Language Arts Chair. A veteran educator, Mrs. Waldron-Brown has also taught English at several highly competitive middle and high schools, including Radnor High School and Episcopal Academy. Mrs. Waldron-Brown’s tutees gain confidence as they learn writing tools and thinking strategies to improve their understanding of how to cogently express themselves with clarity and conviction.